Joel Hinds and Deon Saffery finally got their hands on the British Under 23 trophies at Hunts County a year after finishing as runners up. Both finals were great showcases with some wonderful squash. No1 seed and World No60 Saffery defeated Emma Chorley to add the British Under 23 title to the Under 17 crown she took back in 2004. The match started tentatively with unforced errors from both players with neither looking able to take the initiative. 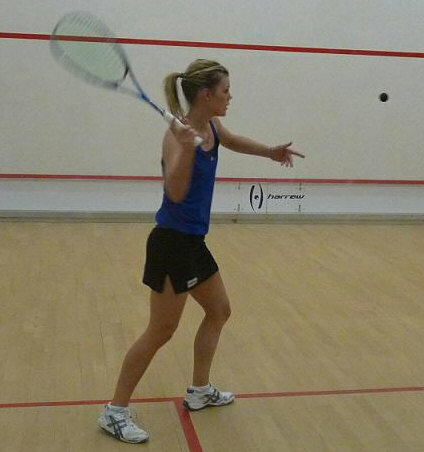 At 6-8 down Saffery suddenly discovered her length and eased away to take it 11/8. The second was close but Saffery again had the edge and took a two game lead. Things started to change as the third started and Chorley surged ahead to start a remarkable comeback. She made it back to 2-1 with an easy 11/3 and then lead throughout a tight fourth and eventually took it 11/9 to square things up. As Chorley went 2-0 up in the decider it looked like it was going to be her day but then Saffery somehow regained her composure and took six points on the run - this seemed to brake Chorley's spirit and Saffery went on to take it 11/6 in 50 minutes. A great match with some excellent squash from both players. The Men's final saw the No3 seed Hinds up against Joe Lee who had survived a marathon semi final against Eddie Charlton. Lee showed no effects of his semi final exerts as he powered out of the blocks and took the first 11-7. Hinds roared back to take the second 11/4 and then edged a close third 11/9. The fourth was a fantastic battle with both players going for their shots and retrieving everything the other threw at them but in the end it was Hinds who held his nerve to take the championship his first British title. A wonderful weekend of squash and thanks must go to all at Hunts County for staging such an impressive championships. The event will return to Cambridgeshire again next year as will Joe Lee, Adrian Waller and both beaten women's semi finalists Carrie Ramsey and Sarah-Jane Perry, all in search of the coveted British Under 23 titles. Derbyshire's Joel Hinds rose to the challenge once again and dispatched the No1 seed Adrian Waller in the semi finals - just as he had done to Tom Richards last year. Hinds got off to a great start and came out with all guns blazing to take the first 11/6. Waller started to find this rhythm as the second got under way and he began to control the rallies and move Hinds out of position. The match started to turn direction and Waller levelled and then took the third to look the likely victor. However Hinds was having none of it and fought back to take it into a decider. The full house was expecting fireworks in the fifth but Waller seemed to run out of stream and Hinds pulled away to make the final for the second year running. In the second semi final it was No2 seed Joe Lee who got the flier, taking a 6-1 and 10-5 lead over No4 seed Eddie Charlton. Then Charlton found his feet and staged a mini comeback to get to 9-10 before Lee closed it out just as the gallery lights went out! Charlton took the initiative in the second and levelled the match at one-all. In the third Charlton strode to 6-1 thanks to some excellent drops and boasts and took full advantage to race into a 2-1 lead. Both players came out fighting in the fourth with intent and neither giving much away. Some excruciatingly long rallies ensued with drops galore and some unbelievable retrieving - a 56 shot rally ended in a let! At 13-12 to Lee this could have gone either way but a tight ball down the backhand side was unreachable for Charlton - two games all! The fifth was a real nail bitter - Charlton went 7-3 up but Lee never gave up believing and somehow managed to fight back and take a fantastic win. Some incredible squash with neither deserving to lose the best match of the weekend by a country mile ... in fact the best match I've watched in a good while. The first Women's semi final was a strange affair. No1 seed Deon Saffery was always going to be the favourite against Sarah-Jane Perry and found it easy in the opener and took it 11/5. Perry seemed to be completely out of sorts, struggling to get any length or pattern to her game and quickly went 2-0 down. The match had 3-0 written all over it - but then at the start of the third it all changed. Perry forced her way back into proceedings and Saffery's game suddenly started to break up and it was soon back to 2-1. The fourth was much better quality with both players competing hard for each point. Perry lead 6-2, 7-4 and 9-7 but it was the experienced Saffery that dug deep to take the game 11-9 and the match 3-1. Saffery can now look forward to tomorrows final hoping to add the Under 23 title to the Under 17 crown she won back in 2004. In the other semi final Emma Chorley took on Carrie Ramsey, who joined the senior ranks today leaving the juniors as the reigning European Under 19 Champion. It was a nice encounter and close throughout the first and second games but Chorley's experience was a step too far for Ramsey Chorley taking it comfortably in 34 minutes. The quarter finals kicked off with Adrian Waller (Hertfordshire) taking on Charles Sharpes (Surrey) on the show court at the prestigious Hunts County Club in Cambridgeshire. Waller, the World No58 showed why he is the No1 seed with an impressive display against the highly talented Sharpes. It wasnt that Sharpes played badly but Waller always looked to be in total control and eased to a 11/6 11/7 11/9 victory. Waller now faces Joel Hinds (Derbyshire) who dispatched Ben Coleman (Essex) in a slightly scrappy affair. This evenings semi will be interesting with Hinds hoping to reach the final for the second year running. Eddie Charlton (Nottinghamshire) continued his quiet move through the draw with victory over former European U19 champion Anthony Graham (Gloucestershire). It had been Graham who had started the stronger taking a 5-1 and 7-2 lead in the first but Charlton soon found his feet and showed why he is a top 100 player in the world. Charlton winning 11/9 11/7 11/2 in 31 minutes. The last quarter final saw former junior British Champions and old rivals Joe Lee (Surrey) and Neil Cordell (Yorkshire) cross swords. These two had enjoyed some great matches at junior level and although Lee had progressed further up the world rankings a tight encounter was again expected. Unfortunately this never materialised and Lee showed his class with a quick 11/5 11/4 11/5 victory to take him into the semis. The Women's quarter finals were straight forward with the top seeds all progressing. Hot favourite Deon Saffery (Wales) was slow out of the blocks and was always playing catch up in the first against Harriet Ingham (Surrey). After saving two game balls Saffery slowly took control and nicked it 12-10. The second was also close but Saffery had seized the initiative and went on to win in 3. European Under 19 Champion and birthday girl Carrie Ramsey (Yorkshire) started her campaign with victory over Katherine Quarterman. Next up for Ramsey will be No2 seed Emma Chorley (Somerset) who didnt give much away in her 11/3 11/5 11/3 win over Annabelle Collins-Ballands (Kent). The first real upset of the tournament was caused by Charles Sharpes (Surrey) who saw off an out of sorts Lewis Walters (Nottinghamshire) in straight games. Sharpes, the current English Junior Under 19 Champion was too good for the No5 seed and despite a fight back in the third always look good for a 3 nil. The reward for Sharpes is a quarter final spot against No1 seed Adrian Waller (Hertfordshire). Waller didn't appear to be suffering any effects from his unscheduled delay in Dubai as progressed with victory over Chris Fuller (Northamptonshire). Joel Hinds (Derbyshire) returned to Hunts County today with one aim to go one better than last year and claim the Under 23 title. Last year he dumped No1 seed Tom Richards (Surrey) out in the semis before eventually losing out to Chris Simpson (Hampshire) in the final. Hinds who is now starting to climb the world rankings faced Andrew Birks (Shropshire) in his second round and came up against some stiff opposition. It was a lovely match to watch with some immense rallies as both players moved each other around the court with ease. However after losing the third it was Hinds who stepped up the pace and took the match 3-1. Hinds now faces Ben Coleman (Essex) who defeated James Earles (Yorkshire) quite comfortably in three. Eddie Charlton (Nottinghamshire) looks to be playing well but is yet to be stretched as he moved into the quarters with a comfortable win over Richard Birks (Shropshire). 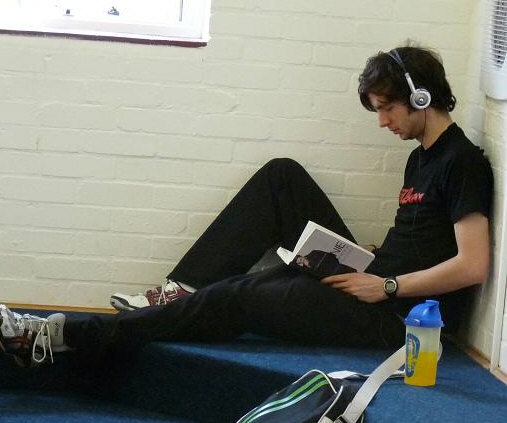 Waiting in the quarters in former European Under 19 Champion Anthony Graham (Gloucestershire). Graham found Alex Phillips (Hampshire) a strong opponent and had to come back from game point down before taking the first 12/10. Graham was then expected to power on but it remained tight throughout a 3-0 but not easy. In the only two Women's first round matches Katherine Quarterman (Oxfordshire) overcame Sophie Lemom (Essex) and Annabelle Collins-Ballands (Kent) defeated Jade Thompson (Yorkshire) both 3-1. The Quarterman Lemom match was a real battle and looked to be going the way of former British Junior Champion Lemom who took the first two games. However Quarterman, who has just left the junior ranks dug deep and fought her way back into contention and ultimately took the match in a nervy 5th game. Recent travel chaos had threatened the British Under 23 Championships with a number of players stranded in far off parts of the world. Those struggling included Mens favourite and No1 seed Adrian Waller (Hertfordshire) who was stuck in Dubai while Anthony Graham (Gloucestershire) and Adam Murrills (Cheshire) were enjoying a prolonged stay in Canada. It was all starting to look a little grim with the possibility of either delaying the event or redrawing looking increasingly likely. However luck was to be on our side with the skyways opening up just in time to allow most players to get back to the UK in time. The Mens main draw kicked off with all seeds progressing through to round 2 without too much trouble, the only casualty being Nathan Lake (Gloucestershire) who withdrew just prior to the start with a knee injury. Waller opened up with a straight games win over qualifier Tom Robinson (Warwickshire) while No2 seed Joe Lee (Surrey) took out Samuel Hodgkins (Shropshire) by the same score. Local Cambridgeshire interest was cut short with both Robert Dadds and Sammy Chambers succumbing to the No4 seed Eddie Charlton (Nottinghamshire) and Alex Phillips (Hampshire) who qualified for the main event yesterday. The only seeded players to drop any games were the Birks twins, Andrew and Richard who ran out 3-1 winners over Steven London (Kent) and Declan James (Nottinghamshire) respectively. The Women's first round starts today but the top seeds including hot favourite Deon Saffery (Wales) and Emma Chorley (Somerset) sit it out until tomorrow so they can relax and enjoy the sunshine and barbeque that once again accompanies the championships. Former British junior champions Adrian Waller (Hertfordshire) and Deon Saffery (Wales) head the seedings for the British Under 23 Championships, supported by Huntingdon Marriott, which are being staged by the prestigious Hunts County Squash Club in Cambridgeshire between 23 and 25 April 2010. The draws announced today include the top players in the age group from around the country. Adrian Waller, the World No58 has enjoyed a great run on the PSA World tour this season and is scheduled to meet long time rival and World No85 Joe Lee (Surrey) in the final. The top two are unlikely to have it easy with third and fourth seeds Joel Hinds (Derbyshire) and Eddie Charlton (Nottinghamshire) respectively looking to cause upsets. Hinds, who is seeded to meet Waller in the semis, took out top seed Tom Richards (Surrey) in last year’s championship before eventually losing in the final to Chris Simpson (Hampshire). With Victoria Lust (Bedfordshire) out through injury Welsh No1 and current World No60 Deon Saffery takes top billing in the Women’s draw. 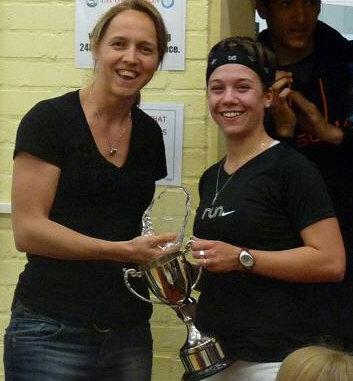 It was Saffery who ended Lust’s challenge for this title at the semi final stage last year before eventually losing out to Fiona Moverley (Yorkshire) in the final. Saffery, based at Pontefract will be looking to go one better this time and claim the Under 23 title to add to the British Under 17 crown she won back in 2004. Emma Chorley (Somerset) is the No2 seed with former European Under 19 champion Sarah-Jane Perry (Warwickshire) at No3 and Derbyshire’s Millie Tomlinson No4. 18 year old Carrie Ramsey (Yorkshire) who sensationally claimed the European Under 19 title a few weeks ago is playing the squash of her life and will have her sights set on gate-crashing the semi finals and continue her fantastic run of form. The standard of entries has once again been fantastic with no fewer than 15 current and former British Junior Champions on show. The event gives the very best junior players in the country the opportunity to fight it out with full time professionals who are already rising up the world rankings. 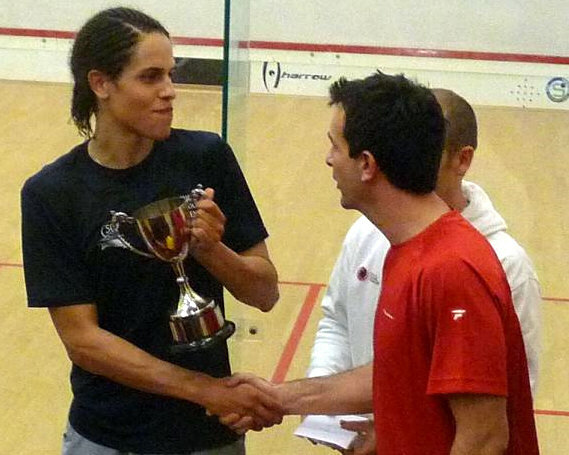 The British Under 23 Championship was re-launched last year as a joint venture between England Squash & Racketball, the British Squash Professionals Association and The Sports Academy at Hunts County Squash Club. This year’s event has a prize fund of £3450 and promises to build on the success of last year and further establish the championships as one of the country’s blue ribbon tournaments. 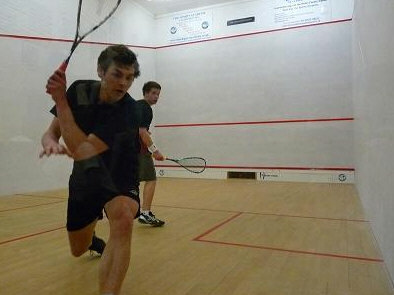 Men’s Qualification takes place on Thursday 22 April with the main draws kicking off on Friday 23 April.